This entry was posted in Interactive Gameplay on January 21, 2016 by saadchaudhryme. Haris gave me a tutorial to create the main menu and activate the level. Followed the tutorial but main menu would not activate the level. This is the tutorial I followed to create the main menu. I created the image in photoshop and then followed the tutorial. Here is the blueprint for my menu. This did not start the level. The screen remained on the main menu when I pressed the start button but the quit button worked. This is another tutorial I followed to see if I could get the start button to work. This is the documents I followed to try and activate the main menu. Googled to see if anyone has ever had the same problem and found this. I have already worked on trying to get the main menu to work for about 6 hours over the week. The assignment deadline is coming up but will try and give it another go if I can find the time whilst completing the other assignments. This entry was posted in Interactive Gameplay on January 19, 2016 by saadchaudhryme. I have been trying to put a health screen in this game but unfortunately can not get it to work. It would not connect to my game and now due to lack of time before the deadline I won’t have time to do further research on this. Today was a workshop and we continued working on our games. Our game is going well but still having problems with the main menu. Spoke to Haris about it and he thought I might not have correctly followed a tutorial or missed out some files. He gave me another tutorial to follow. I spent some time doing this but still having the same problem where the main menu does not start the level. Haris thought I might have been only creating one map but after checking I do have two maps but there just seems to be some problem connecting the main menu to the level. Getting really frustrated with this now and after checking with Haris he said this was not part of the criteria for the module. We might get an extra mark but if we were still having issues we could scrap the idea. I will try again at home but the closer it is getting to deadline day I am cutting it fine but will persevere a couple more times and see if I can resolve the issue. Will update if and when attempted…..
Me and Steven continued tidying up the design document. Michael was also finally here and still promising the audio, still a waiting game…. Both me and Steven have decided that we will find whatever audio we can as a back up just in case Michael doesn’t pull through. We also had a couple of the students road test our game. Their feedback was pretty positive. They liked it visually and said that to look at it, it seems like it would be an easy challenge and does what it says on the box and that was a game for all ages which should be very easy to play and complete. They were in for a little shock because when they started playing they did struggle a few times to get past the first stage. They liked the little surprises like the jumping alligators and crumbling bridge. In the end they said they were really enjoyed playing the game and it was very deceiving in its simplicity because it actually turned out to be quite challenging. Really happy, because this game took a lot of research and effort to get it working. Steven’s concept was very strong but having never used unreal engine before it was a definitely a learning curve to create the game. Overall, a mixed day. Frustrated with the issues of the main menu but happy the game was well received. Why buy or play a game? Is it because of the story, graphics or technical aspects? What is more important, content or technical aspects? If the content is good why do the graphics or technical faults effect your play? More people are now able to develop and sell their games but there are so many similar games now. We also continued with our glitch projects because the deadline was the next day. We also got feedback on how are games were going. Me and Steven got very positive feedback and all the frustrations of creating it seemed worthwhile. Me and Steven decided to make a start on creating our game in Unreal Engine 4 so we could start getting feedback from each other, Michael and Haris. We had already discussed Stevens interpretation of how he wanted his game to look like. 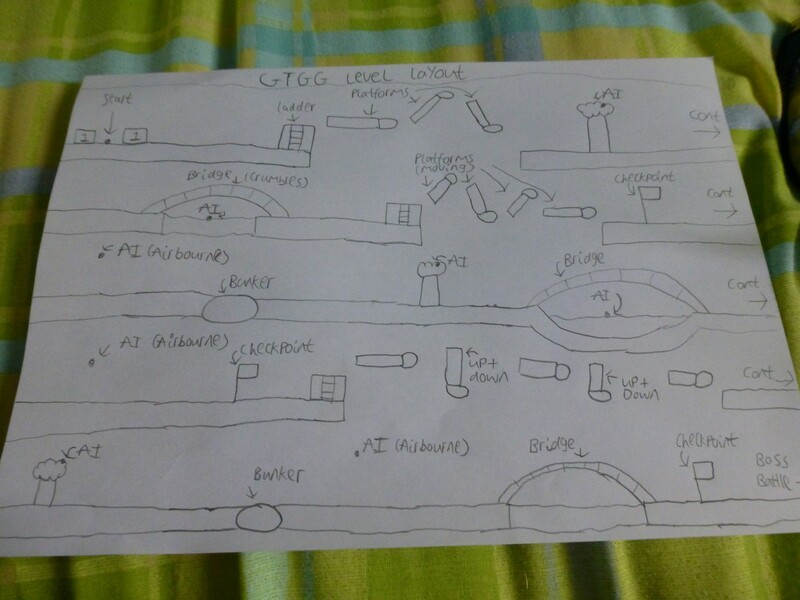 Steven sent me a rough sketch of the level design. I started creating the platforms in unreal engine. Our game is 2d so I was trying to create a flat version in unreal engine. I could not figure how to do this even after going through loads of tutorials on the internet. 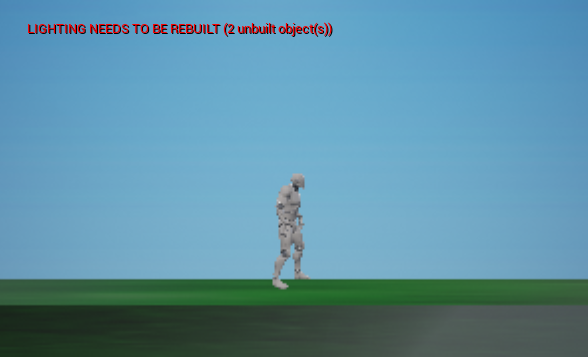 In the end I figured that even though the game is 2d in the unreal engine environment we would make the game with the character moving backwards and forwards and use the side scroller 2d template. Saad: Hey Guys, Here is the Game Production Schedule and waiting for feedback and so I will send to Harris tomorrow. Steven: Looking good Saad. Nice colour coding and layout, it will be fine to send. Saad: Brilliant, that really good and looking forward to have at it today. Saad: Hey Michael, just wondering that you were not in class today and have you given any further thought about your part of making the game. Haris was asking for updates but not sure if you had any thoughts about your parts. Steven: Hey there. I’ve created a design document for the game, in time content will be added. Saad: Brilliant and Well done, No contact from Michael yet? Steven: Nice one. If I can get any response from him, I’ll let you know. Steven: Hey there Saad. I’m just spacing out content on the design document. Would it be okay if you could start constructing a level? Start with this for now: -Blue Sky -Ground Dark Green gradually to Light Green I’ll design some golfing platforms and bridge ideas later. Any thing else you want to add, just say. Saad: Yes, that fine is the idea for the level in the document because I need to know what to create. Steven: Not yet, I’ll get one drawn up as soon as possible. Saad: Ok, that fine and send me rough sketch whenever you can and I will start straight away. Saad: Thanks Steven and I will work on it on unreal engine 4 on this weekend and we have made good start. Steven: Okay then, good start so far. Saad: Hi, Here is game level so far but it took age to find how to create 2d side scroller so I used Side Scroller in unreal engine 4 But I am trying to figure out how to create ladder but still no clue so we will ask Harris about this. I will keep trying if I can. is it how you want the scene to look? Steven: Looking good, that’s how I visualise it. If possible could you add some a gap in the scenery, as in one floor, a gap then another floor? Saad: no problem will try and get that done. Saad: hi, can you make character sprite? 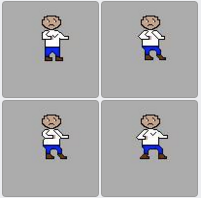 Here is image of character sprite example. Steven: Nice one. I’ll get one started. Saad: cool, did you check video in group facebook chat i have made that you told me last night? Saad: ok, is that ok? Steven: Looks good though I think there’s too many gaps. I was planning maybe 1 long stretch of green, 1 gap and then another long stretch of green. I’m in bad shape, i have problem with health. Saad: ok, how are you feeling? Check with Steven as He is in charge of this project. here is video that I have made in unreal engine 4 so far. Steven: This is current progress on the sprite. Warning, it’s quite a small size! Steven: Hey there. I’ve drawn a sprite of the villain, just drawing some of the weapons. Steven: Hey people. Just a heads up. I’ve drawn the upper body of my main character’s walking sprite, I won’t be able to work on Photoshop till Sunday evening or Monday. Michaeł: Hey steven r u able to sent me your presentation? Steven: Hey there everyone. I’ll write up some stuff later about the audio/sfx. Still doing some sprites for the characters. Steven: During Level Casual and relaxing with a medium pace. Boss Battle Dramatic sounding music with a fast pace. Getting Hit/Enemy Hit Whistle sound effect for animal AI. Heavy harsh clanking sound for enemy vehicle AI. I’ve posted some ideal audio effects for the above for Michael. Saad, would it be possible to include sand bunker texture and lake? Saad: Yes sure, I will do that. Saad: hi guys, here is the game i have made so far in unreal engine 4, check it out and what do you think? Steven: Nice job, that’s how I imagined it. like emoticon I’ll work more on drawings in the week ahead. Saad: Hey Guys, here is updating game i have made so far and I have add main character and add some new level and Check it out and what do you think so far? Steven: Looking good Saad. I might have to revisit some of the Gary drawings. I drew some other sprites, which I can send another time. Saad: Ok, let me know how it goes? Steven : Here are some drawings. Top Left (Drawing 2), Top Right (Drawing 3), Bottom Left (Drawing 4), Bottom Right (Drawing 1). Sorry for the messy layout! Steven: Slight update of the design document as it currently looks, some of the pictures have a colour background. Saad: It looking really good and good start on design document. Saad: hey guys, here is the game so far? Steven: Impressive Saad. Is it possible to make the pigeon enemy a bit bigger, have it floating in the air? And when Gary is standing still, have it the same height when he’s running? Saad: Thanks Steven, is it all updating? I will make better like you said. Can you send me updating document design so i will have look at it and will add some part of it like level design? Saad: here is the game so far and I have add AI in this game so far. Michael: Im almost done on audio ill give it to u before weekend. Saad: Thanks and looking forward the audio. Steven: Good effort everybody. I’ll try and draw up a visual cutscene, like you see at the start of a game. Saad: Hey guys, I have updated the game with add more AI and the bridge turn into broken then fall off. Steven: Nice one 🙂 Is it possible to make the bridge crumble only when the player is on it? Saad: Hi guys, Check this part of the game now. Hope you like it. I was wondering what to do about Greg. 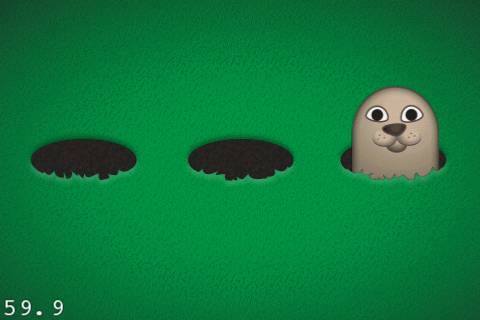 How about mole in the hole type event. I have to work out how to do it but it will bring Greg in earlier in the game for some more excitement and also let Gary use his club. We will try to figure out how to add the vehicles later on if we can. Steven: Looking good. I was intending to have Greg on the screen, then disappearing and that’s where the tank comes in. When you beat it, Greg runs off. Decent idea with the mole though. Saad: Sorry I don’t understand, please can you clarify what you just said? Steven: Sure. When you get to the end of the stage, Greg is there with his ‘loser’ speech bubble then he runs off, the tank comes onto the screen (you don’t see Greg enter the tank). Saad: Oh ok, will work it and Hi, just wonder any update the game design document? Steven: I’ll send it to you in a minute, just putting some new stuff on it. Steven: One favour, could you put your first name and student number underneath my details? It will be on the cover page. Saad: hey michael, any luck about audio? Hey Guys, I have updated the design document a little bit. I have left all of Stevens bits and just added some extra. Check it out and let me know if your happy with it and then will tidy it up some more. but still need to add more details. Will work on it at college together.Everyone keep adding on their ideas. and I have updated the game by adding more challenging AI. Steven: Looking good, nice design document as well. I wasn’t sure what to put on it! Saad: Glad you like both but still need to add some technical stuff on it. We will need to research this and add on at some point. We still need to design a games cover so our game will look more complete and think about whether we should Photoshop some of those extra challenge ideas ourselves so it looks like our idea and work. We can all share this job. What do u think? Also just wondering if we should add Greg in various parts of the game because he is the main enemy and it will show him getting angrier as he fights Gary in challenge s like mole in the hole and pushing him into another hole etc. Then then last part can be the boss battle with the tank. We can try to condense all of this into the game. What do u think? In my opinion, I think we should keep Greg till the end of the level. It will keep people guessing into who the character is. Steven: How’s the audio coming on Michal? Saad: Hey Michael, any luck about audio. I need it by tomorrow you promised it 2 weeks ago. Hey Steven can you make the game cover? What Greg do at end of game? Saad: Hi Steven just checking what is the blue armour for and how do u get it? Steven: The armour has its own hit points, health stays normal. I was planning, to collect you walk through it like the golf balls. Hey Guys, I have updated the design document. have a look at it and if you need to add anything add it in colour so we can update this as the next version. Steven: Just updating the design document, adding a contents page to it. These are .wav files, did you want the mp3 format as well? you can send me email and it might work. michael checked your audio but it keeps opening in cinema 4d and is not recognised. Had to turn off the security settings on my internet as well. Send the audio on google drive and i will try that way. Saad: No I don’t have one and can you transfer to wav? Saad: Ok, can you send me without winrar like send me email? Michael: i send it again folder with files you should have it now. Michael: try now https://drive.google.com/drive/u/0/folders/0B8p1–cV7O09am54eV9fUFp6bGc is it fine now? Saad: I have got them now. I will try and add these ones. I did already add audio last night but will try and transfer the sounds to your ones. Will let u know in about an hour if it worked. Saad: Will do Can you give me reference for sound because I need add in design document? And will can’t your sound until you give me sound reference? Saad: The links from where u found the audio. And if you created them yourself then how u created them and on what date. Haris send we have to reference everything otherwise will lose marks. Steven: Video Game Sounds.docx Here are the ones I found the other day with Harvard Referencing. Saad: Michal, Any update about sound referencing? To collect golf balls in 2D game like collecting coins. I researched various youtube videos on how to create collecting coins in 2D game in unreal engine 4. Here is the video tutorial of collecting coins which I followed. It really helped but lots of blueprints to do. This is how collecting the golf balls blueprint looks like. This entry was posted in Interactive Gameplay on January 18, 2016 by saadchaudhryme.